I didn’t expect to like this Vita Liberata mousse as much as I do. Unfortunately, Vita Liberata products haven’t impressed me in a very long time. They keep launching new products, but they always miss the mark in my opinion. Fortunately, this one is an exception, and I think it’s a good self tanner. They have 3 different shades in this mousse; I tried the medium to dark shade (which Is the middle shade). After one application, I was really happy with how my tan looked. It was a medium to dark shade and it was sun-kissed (not orange or fake looking). Now, you need to pay extra attention when applying this one as there’s more room for error due to it having no color guide. I was extremely careful while applying it and had good results with no streaking. One thing I didn’t like is that the self tanner arrived damaged. Half of the bottle was already gone as it spilled in the box. That was really annoying. It also claims to not transfer onto anything, which isn’t true. It stained my white sheets and even got on my bra. I don’t think this is a good self tanner to start off with if you’re new to self tanning. This is more for experienced self tanners. There’s little to no scent; it dried in an average amount of time, and application is pretty hassle free. So I ended up giving this mousse 4 out of 5 stars. This is another mousse that has no color guide. These colorless mousses seem to be all the rage right now. In the bottle, it looks like a clear liquid (like water). The mousse pumps out white in color, and it has a bubbly, fluffy texture. Applying Vita Liberata Invisi Foaming Tan Water is easy and mess free due to their being no brown guide. But you also need to be very careful while applying it, as it’s easy to miss spots because you can’t see where you’re applying. Although this mousse doesn’t have color to it, I still used a tanning mitt to apply it in order to protect my hands. This also made for easier and faster application. I found the product blended nicely into my skin and didn’t require a lot of elbow grease to blend in, which is always a good thing. This one dries in average time for a tanning mousse. It took about 30 minutes and it felt a little bit sticky as I waited. This one doesn’t have much of a smell, but the smell it has is a faint DHA/self tanner smell. I could only smell it if I really tried. So this one doesn’t smell particularly bad, or good. By the next morning (after my tan developed), I could smell more DHA than the night before. It still wasn’t very overwhelming, but the self tanning scent was definitely there. I was surprisingly impressed with the color I got from using this self tanner. I tried it in the Medium to Dark shade, and they actually have an even darker one. After one application, I had a nice, dark tan that was about 3-4 shades darker than my natural skin tone. I was surprised with how even my tan looked, despite the fact I couldn’t see where I was applying it. The color was realistic, and not orange looking. It was bronzey and brown, just how I like it. Now, for those of you who haven’t used self tanner before, I’d recommend starting out with the lighter shade, because there isn’t a lot of room for error when applying this clear colored mousse. One thing I’m not happy about is that this self tanner claims to be transfer free. This is definitely not the case, as it still stained my white sheets. They had brown spots all over them, even though there’s no color guide. So that’s very disappointing and I know this will be a deal breaker for a lot of you out there. But for me (an experienced self tanner), I’m happy with the tan this one gives me! After about 5 days, my tan started fading drastically. Unfortunately, this one doesn’t fade very naturally. I had some really dry looking areas that looked scaley (especially on my legs). I had to exfoliate daily in order to fade it faster. Yes, I think men will like this one… as long as they’re experienced self tanners! Vita Liberata Invisi Foaming Tan Water is a rather expensive self tanner. The bottle sells for $39.00, which is $5.82 per ounce. That’s a bit more than your average self tanner on the market. 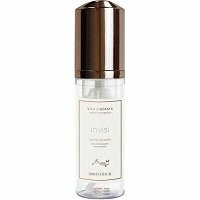 To buy Vita Liberata Invisi Foaming Tan Water, Click Here. Look and Feel This is a clear liquid that comes out as a white mousse with no color guide. Application Applying is easy and not messy. But you need to be extra cautious to not miss areas. Smell (Before) Doesn’t have much of a smell, just a faint DHA scent. Smell (After) Smelled more like DHA/self tanner the next morning. Color Produced I got a natural medium to dark shade tan that was very bronzey. How Long It Lasts It lasted about 5 days and faded poorly. OK For Men? Yes, as long as they’re not novice self tanners. Price It’s $39.00 per bottle which isn’t cheap.